Description - Who says that gym flooring has to be all black with some color fleck? Get a full-color gym floor at discount prices with our Gym Flex Tiles. Our Gym Flex Tiles are one of our most versatile flooring options we offer. These tiles are made from flexible PVC, so they are resistant to most household and vehicle chemicals making them great for garage gyms or as a garage floor. Since these tiles are less dense than our standard flexible PVC tiles, they will provide you with excellent shock absorbency making them great for dropping heavy weights on. Another great feature about these tiles is that they are virtually odor free. One of the biggest complaints with rubber floors is that they smell. Well, with these tiles, smell won't be an issue. A 20-year warranty backs our Gym Flex Tiles. Note: Flex tile colors are produced in batches, which can lead to color variations in your order. All colors may present some color variation, but Black and Dark Grey can produce the most. These colors can vary greatly between batches and thus it is recommended that you order more flooring than is needed for mistakes and replacements. This, in turn, gives you the greatest chance to keep continuity across your floor. Batching will also affect color variation between samples and your order with Black, Dark Grey and Light Grey showing the most variation. Material – Constructed entirely of a proprietary blend of flexible PVC. This custom PVC blend also ensures that the tiles are flexible and have the anti-fatigue flooring qualities often associated with rubber flooring but also the durability, long life, and chemical resistance associated with PVC tiles. Recommended Uses – Our Gym Flex Tiles are perfect for home or commerial use and have been used as flooring in home gyms, garage gyms, as garage flooring, in commercial gyms, as flooring for basements, as spare room flooring, in kitchens, as flooring in patios, and much more. Affordable full-color gym flooring option. 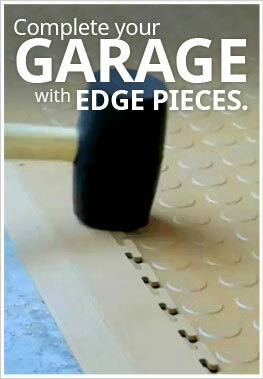 Can be used as garage flooring or gym flooring. Can the gym flex tiles be easily taken up and re-laid in case of water getting under it? Our 7mm Gym Flex Tiles are an interlocking floating floor tile, so they are very easy to install and pull up if water were to get under them. After the area has been cleaned and dried and the flooring has been cleaned and dried, they are very easy to re-install. Got these tiles for my garage gym. Best decision I have made. Got samples.